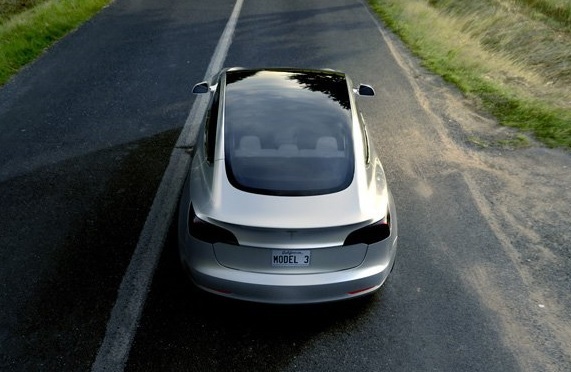 Early on in 2016, news on the debut of the Tesla Model 3 made headlines all over the world. The reaction from the target audience was nothing but positive and it is just a matter of time before this reaction translates to something substantial to the manufacturers. The hype was stimulated around the release of the Model 3 as the message was pushed through social media platforms such as Twitter that were used to make an announcement from Tesla’s CEO that his firm had received a whopping 270,000 orders of this electric vehicle, EV. Apart from receiving such a huge order of EVs, interested customers went ahead to commit themselves to buying this car by paying $1000 as deposit for each unit of this EV. Tesla Model 3 is one of the cheapest value electric car retailing for only 30,000 euros in the European market. It is meant to be part of Musk’s Secret Master Plan that was published in 2006. His main intention was to come up with an affordable EV in the guise of Model 3 that could be made available to different mass markets all over the world. It happens to be one of the most spacious EV’s in the world. It has an outstanding digital dashboard synonymous with Tesla models and a large screen that acts as center control console for the car. Being an EV, it offers the required performance and efficiency vital in using the car. It has a range of about 215 miles before its next recharge making it suitable for long journeys or short trips around the town. Customer loyalty favors the Tesla Company. There is no doubt that most buyers believe in the quality of EVs Tesla produces. For example, hours before Elon Musk’s announcement, many potential buyers had lined up in Tesla dealerships in Europe to pen down a 700 euros refundable deposit in order to secure their orders. Used Tesla Model 3 cars will eventually be available from our network of approved dealers- You can compare prices by using our search function to find and compare similar vehicles. Different dealers will offer a variation of service and guarantee packages. Please ensure you read through all the information on the vehicle listing to gain as much information as possible. Simply click on the button below to find a Model S ready to buy. 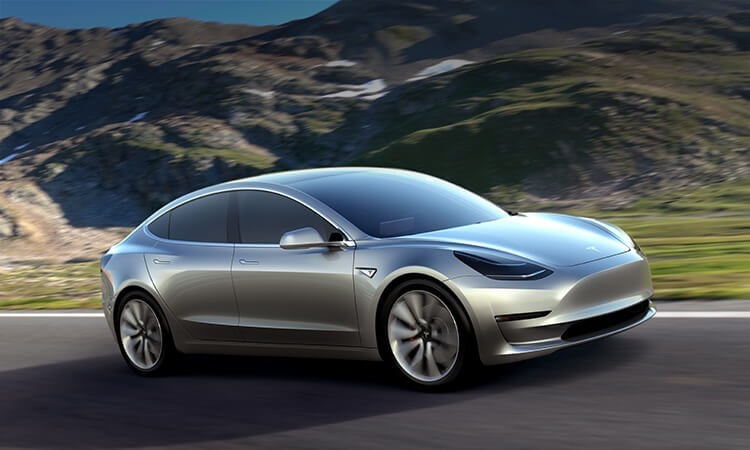 New Tesla Model 3 cars are available from Tesla Motors UK dealers- Tesla now has eight dealerships throughout the UK. Unlike conventional dealerships, Tesla’s are more like shops. Where you can go in a look at a sample car, and design and choose your vehicle specifically. The locations of the UK Tesla stores are available below. Rear-wheel Drive- According to Elon Musk, a rear wheel drive will boost the cars performance. It will also have a dual motor auto wheel drive that is optional. This will give the car a fast torque synonymous with Tesla drive train. Mileage- The slowest Model 3 will hit 0 to 60 mph in less than six seconds; which is not slow per say. However, faster versions of the vehicle will be available. Multiple test drives by drivers at the launch event agreed with the car’s technicians that the EV had an upgraded performance package compared to other Tesla models. Tesla Model 3 is being sold for as low as 30,000 euros. This is relatively cheap compared to the price tag tied to other Tesla models like the Model S that go for over 60,000 euros. However, depending on the user’s preferences, the vehicle may be customised to fit their needs. For example, there is Autonomous software that can to be installed to the vehicle at an extra cost. Tesla is investing heavily into the software to create fully autonomous vehicles. Another issue set to affect the EV’s price is the supercharging feature. Currently, Tesla boasts of having over 1500 charging stations located in Europe and America. Musk assures Tesla lovers of having this figure tripled by the time the Tesla Model 3 is being released to the market. In addition, the supercharging standards will come specifically designed for Model 3 but they will not be free in the long run. However, for consumers in the UK, the government assures them of getting a plug in grant for every green car used in their roads. This plays in favor of the consumer hence benefiting many buyers who may buy this car to enjoy this subsidy of £5000. Incomplete Giga Factory in Nevada- This factory is set to be the base in which the pack of lithium ion batteries and the entire car could be produced and finally fitted into the Tesla Model 3 EV. In addition, the date of completion is still Tesla’s top secret since the construction of the giga factory is set to be finalized in 2016. Little Time to Rethink the Production Planning- Elon Musk is confident that the Tesla will meet its 2018 production plan of this EV. Although the total sales as per now could be less than the expected 200,000, Elon Musk is still positive that with the extra $276 million in the bank, they can meet this production and surpass this target. Late Arrivals of Tesla Models- Although the CEO is confident that the car could be available by the end of 2017, the company’s previous EV, Model X, arrived three years behind its arrival schedule due to problems related to the molding of its seats. There are high chances that Model 3 could also face the some technical delays. Right Hand Drives- Tesla is set to first produce left hand drive EVs for the US and European market. For countries like the UK, this consumer base may have to wait a bit longer till the car rolls out the production plan for right hand drives compatible with driving in this country. Much more information concerning the car remains Tesla’s top secret. There is still time to come up with better and improved features vital in enhancing the car’s performance in the long run. However, we cannot rule out the fact that Tesla Model 3 is set to face stiff competition from world’s renowned auto makers. This is because, most of this auto firms are working hard to come up with much cheaper and powerful EVs. They include BMW’s i3 Series, Mercedes C-Class and Jaguar’s XE who take up a significant market base in the UK. But what favor’s Tesla is its low price for a full EV not counting the plug in car grant that when factored in reduces the car’s cost while also pricing the car competitively for the UK market. As every player in the industrial sector is striving to go green, new inventions and technology is all we can see in today's market. Things are not any different in car manufacturing as electric cars continue finding way in the very competitive market. Tesla Model 3 happens to be latest model of Tesla electric vehicles, EVs, set to be released to consumers towards the end of 2017. Recently, the company’s CEO, Elon Musk made an announcement on Twitter that he had received a whopping 253,000 orders of this car. The car is executive and is said to be the cheapest of the Tesla model of electric cars. This is aimed at propelling this electric car into greater heights in the auto industry. The impact this car is bringing to the American and European markets is remarkable. In the UK, many interested buyers are making a deposit of over $1000 for each Tesla Model 3 they intend to buy. In addition, as announced by the company’s CEO, right hand drive versions of this EV will be fully available to the UK market by the end of 2017. He also hinted that each car will retail at 30,000 euros inclusive taxes and other options that come with the purchase of this car. But buyers in the UK are set to enjoy a plug in car grant from their government and this is set to adjust the car’s prices in order to compete with other giant car models supplied in to the European market. They include, Jaguar XE, Mercedes C-Class, Audi A4 and BMW 3 Series. This EV can cover up to 215 miles before the next recharging. The recharge system is made up of standard equipment synonymous with Tesla EVs, where the car can recharge in minutes. In fact, the EV can get a 80% charge in under 30 minutes. The US and UK enjoys a great share of the world’s super charging stations and this should not be a problem for UK Tesla lovers since the firm intends to double the number by the end of 2017. By the time Tesla Model 3 is being released, the firm aims at having tripled the present number of charging stations, located in shopping centres, airports and carparks that will be in partnership with Tesla. This aspect is one of the most crucial ones any car buyer takes keen interest in. Tesla’s CEO hinted that the EV will accelerate from 0 to 60 mph in less than a six seconds. This makes it’s the best EV for short trips and around-town movement in the long run. Moreover, Elon Musk promised that the company would make faster Model 3 EV before releasing them to the market. 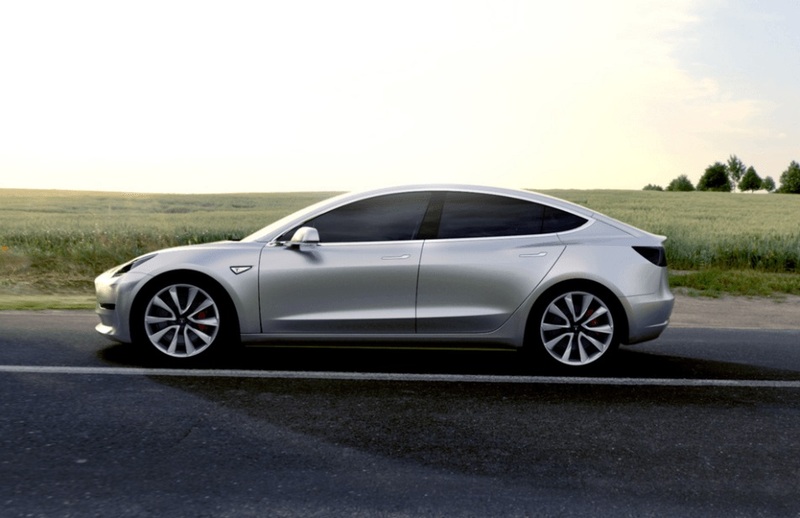 Tesla Model 3 is almost three quarters the size of its predecessor Model S. It has a slopping hatchback roofline, with the wheels sprouting out of the car’s four corners. This gives the car the maximum interior space in the long run. The EVs under floor houses the large battery making the car’s cabin floor thick hence reducing the car’s interior space. The car’s cabin is meant for only five passengers. 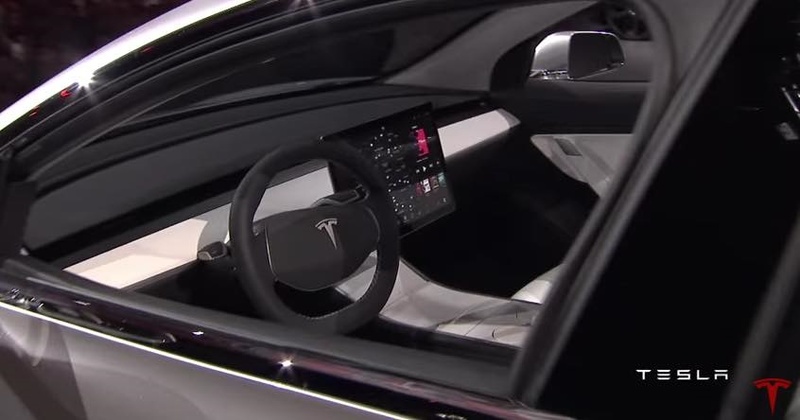 However, the car’s dashboard is bare except for a large touch screen that is landscape oriented unlike the portrait oriented ones in Model X and S. The touch screen is meant to operate the car’s controls and vital information pertaining to the car’s performance. The speedometer read out, is placed on the left hand corner of the dashboard. The car comes with a self-driving technology, a signature feature in all Tesla models. In addition, an Autonomous Emergency Braking is set to be fitted into the EV although the buyer will have to settle the full installation cost of the Autopilot software. This Autopilot software is set to bring an autonomous driving making Tesla Model 3 a revolutionary EV. The reason why this EV is cheap is to make it available for the middle income earners. This is aimed at gaining more customers to purchase this EVs in different countries. The price point has seen Tesla outsell other giant car models in UK since this client base looks at more than the economic cost of running cars but also efficiency and performance of a car, hence knocking out gasoline engine cars.